I am taking a Comparative Lit class on child soldiers around the world. I just finished A Long Way Gone and am desperately trying to take it all in. Here is the excerpt and a quick explanation about Ishmael’s Beah’s amazing book. You should definitely read it! At the age of twelve, he fled attacking rebels and wandered a land rendered unrecognizable by violence. By thirteen, he’d been picked up by the government army, and Beah, at heart a gentle boy, found that he was capable of truly terrible acts. Eventually released by the army and sent to a UNICEF rehabilitation center, he struggled to regain his humanity and to reenter the world of civilians, who viewed him with fear and suspicion. This is, at last, a story of redemption and hope. My high school friends have begun to suspect I haven’t told them the full story of my life. This is how wars are fought now: by children, traumatized, hopped-up on drugs and wielding AK-47s. Children have become the soldiers of choice. In the more than fifty conflicts going on worldwide, it is estimated that there are some 300,000 child soldiers. 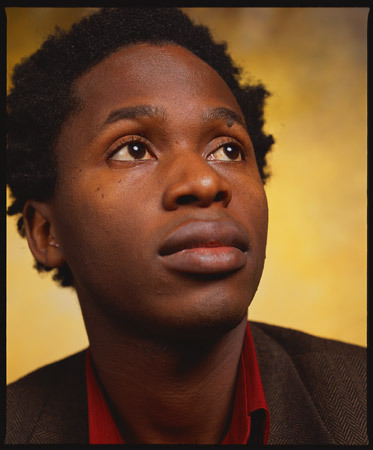 Ishmael Beah used to be one of them. What does war look like through the eyes of a child soldier? How does one become a killer? How does one stop? Child soldiers have been profiled by journalists, and novelists have struggled to imagine their lives. But it is rare to find a first-person account from someone who endured this hell and survived. In A LONG WAY GONE: Memoirs of a Boy Soldier, Beah, now twenty-six years old, tells a powerfully gripping story: At the age of twelve, he fled attacking rebels and wandered a land rendered unrecognizable by violence. By thirteen, he’d been picked up by the government army, and Beah, at heart a gentle boy, found that he was capable of truly terrible acts. At sixteen, he was removed from fighting by UNICEF, and through the help of the staff at his rehabilitation center, he learned how to forgive himself, to regain his humanity, and, finally, to heal. – Click here for more. Or click the picture for the nytimes article.